The Pearl & the Oyster - Transitional - Bathroom - Toronto - by Square Footage Inc.
Nice bathroom - What tile did you use ? Lightning - Where is the chandelier from? You can find an in-depth answer to your question here. Let me know if you have any other questions or inquiries. Thanks! Happy to help; good luck with your renovation! Is there a shower door here on the shower? could you tell me the dimensions of the wall and floor tile please? - could you tell me the dimensions of the wall and floor tile please? The bathroom is beautiful. Unfortunately I live in the US so can not use the same tile you used. Thanks for your help. thank you for this information. can you tell me the make and model of the tub. it is beautiful. No problem! You can find detailed information about the tub here. Let me know if you have any further questions. Thanks! What is the tile used along the back wall and on the floor? - I like the look of the Tile and was wondering where it was bought ? I went to ceragres, did you use apuano mix for the walls? And what color on floor? We used a mix of matte, anticato, rullato and polished tiles, except for the floor, which is purely matte. Thank you for your question! These tiles are from Ceragres, from a series called "White Experience". We used 24"x24" tiles for the floors, and 8"x48" tiles on the walls. The floor tiles are matte, while the wall tiles are in a variety of finishes — matte, polished, textured, etc. You can find more detailed information regarding these exact tiles here. What is the brand of the tub faucet? Thanks for your question! The brand of the faucet is Brizo. Let me know if you have any more questions! You can see all the Brizo tub faucets available for purchase here. Feel free to reach out with any questions! Thank you for your question! It's my pleasure to answer them. The colour we used in this project is called "apuano." We used a mixture of all the different finishes available in this project. If you would like more details, please feel free to email me (kristian@squarefootageinc.com) or send us a direct message on Houzz. flooring matte vs matte with texture - Do you think the Anticoto (matte w texture) would work as well as matte. I realize that the matte w texture will tame down the pattern. Also what was the mix for the wall ie. percentage matte, anticoto, polished and the ribbed format. Thank you for your questions. Please send us a direct message and I will answer your inquiry in greater detail. Thanks! Thanks for your question and kind words! The washroom is roughly 18'x11', and the shower is about 5'x3'. I hope that helps! Let me know if you have any more questions and/or inquiries and I'd be more than happy to assist. Chandelier? - Can you tell me where you got the chandelier? The chandelier in this project was actually supplied by the client, so unfortunately I don't have an exact answer to this question. Please let me know if you have any more questions and I'd be happy to assist. what color and material was used for the countertop? Dimentions - Beautiful bathroom! What are the dimensions? would you be able to share the layout? where is the water closet? how much space is between the tub and vanities? I'm trying to figure out if I have the space for this. Thanks!! Thanks for the compliment! Unfortunately I am not able to share the layouts or drawings with you, however, I can give you some information regarding the dimensions of the space. The washroom is roughly 18'x11'. The water closet is located on the left hand side of the tub/shower area. We tried to get photographs of it, but unfortunately our photographer's equipment was too large to get a good angle! To give you a better of idea of where exactly it is, this photo (http://www.houzz.com/photos/63944271/The-Pearl-and-the-Oyster-contemporary-bathroom-toronto) was taken from the WC. Finally, there's a little over 3' between the tub and vanities, and the shower is about 5'x3'. I hope this helps you with your project! Let me know if you have any more questions! Amazing bathroom! - Gorgeous bathroom! Could you please tell what sizes of the tile were used on the wall and floor and if everything is polished? Did you use a different time for a shower floor? Also, what black tile did you use as an accent? Thank you! Thank you for the kind words! We are very proud of this bathroom so it's nice to hear. As for the tiles, these are from Ceragres (http://www.houzz.com/pro/ceragres/ceragres), from a series called "White Experience". Let me know if you have any more questions! Happy new year! Gorgeous bathroom! - Absolutely love these tiles! What size of tile did you use in the wall? Was it a mix of finishes or did you use all gloss tiles? They come in a number of sizes and finishes. In this project we used 24"x24" (floors) and 8"x48" (walls) sized tiles and a mix of finishes — matte, glossy, textured, etc. 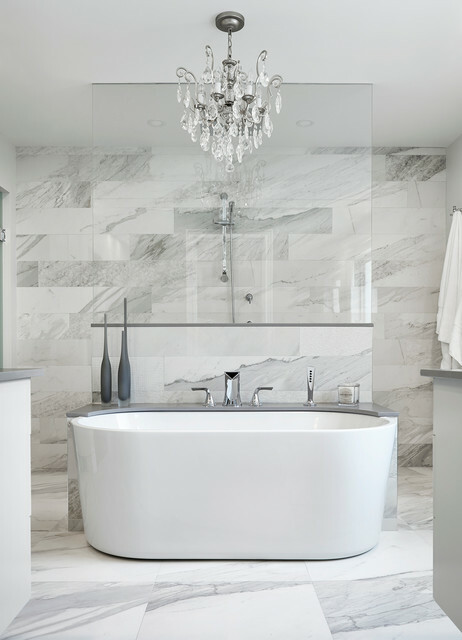 Love the tub - Can you tell me the maker and model please? Thank you. I like the floor but not really the wall?